[AUTO] (VC) [Limit Break 4]: [Counterblast (1), Soulblast: (3), discard 3 <<Genesis>> from your hand] At the end of the battle in which this attacked, you may pay cost. If so, Stand this, and this gains +5000 Power for the turn. This ability cannot be used again this turn. [CONT] (VC): If "Sacred Regalia of Wisdom, Angelica" is your Soul, this gains +2000 Power. [CONT] (VC/RC): Lord (If you have a unit without a same clan as this unit, this unit cannot attack). Genesis finally decided to unleash "omniscience". 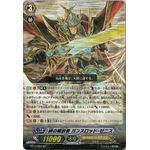 [ACT] (VC) [Limit Break 4]: [Counterblast (2), Soulblast: (2)] Unlock all your Locked cards, and if you have 5 <<Gold Paladin>> Rearguards, this gains +10000 Power and +1 Critical for the turn. At the end of that turn, Soulcharge: (1), and choose a card in your Damage Zone and turn it face-up. [CONT] (VC): During your turn, for each <<Gold Paladin>> Rearguard you have, this gains +1000 Power. Brilliant Lion, break the lock and weave the future! 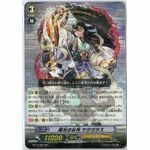 [ACT] (VC) [Limit Break 4]: [Counterblast (1), Lock 1 of your >>Kagero>> Rearguards] For the turn, this gains "[AUTO] (VC): When this Drive Checks a Grade 1 or higher >>Kagero>>, choose up to 1 of your Opponent's Grade 1 or lower Rearguards and Retire it, and this gains +3000 Power for the turn". This ability cannot be used again this turn. [CONT] (VC): If "Dauntless Drive Dragon" is in your Soul, this gains +2000 Power. No matter which path it takes, the soul that seeks victory do not waver. [AUTO] [Limit Break 4]: [Counterblast (1)] When a <<Narukami>> Rides on this, you may pay cost. If so, your Opponent chooses and Retires 2 of their Rearguards. Choose 1 of your Vanguards. It gains +10000 Power for the turn. [AUTO] (VC): When this attacks, if you have more Rearguards than your Opponent, this gains +2000 Power for the battle. 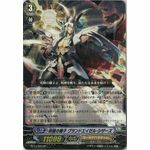 [AUTO] (VC) [Limit Break 4]: [Soulblast: (9)] When this attacks a Vanguard, you may pay cost. If so, draw 2 cards, and Stand up to 2 of your <<Genesis>> Rearguards. 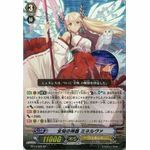 [AUTO] (VC): During the battle in which this is attacked, when your <<Genesis>> Guardian is placed in the Drop Zone, put that card in Soul. This ability cannot be used again this battle. (If 2 or more cards are placed in the Drop Zone at the same time, only put 1 in Soul) [CONT] (VC/RC): Lord (If you have a unit without a same clan as this unit, this unit cannot attack). Filling the sky with sunlight, hope awakes here! 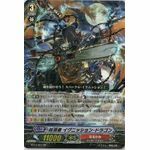 [AUTO] (VC) [Limit Break 4]: [Counterblast (1) - Cards with "Liberator" in it's name, Choose 1 of your Grade 2 or lower Rearguards and put it on the bottom of the Library] When this attacks a Vanguard, you may pay cost. If so, look at the top card of your Library, search for up to 1 <<Gold Paladin>> and Call it to a vacant (RC), then put the rest on the bottom of the Library, and this gains +10000 Power for the turn. [CONT] (VC): If "Solidary Liberator, Gancelot" is in your Soul, this gains +2000 Power. Noble soul reaches the apex. 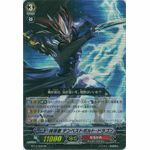 [AUTO] (RC): When this attacks, if you have a Vanguard with "Ashley" in it's name, this gains +2000 Power for the battle. [AUTO] (RC): When this hits a Vanguard with an attack, if you have a Vanguard with "Ashley" in it's name, choose 1 of your <<Royal Paladin>> Units. That Unit gains +3000 Power for the turn. Brave maiden continues to fight, beliving in the light that is thefuture. 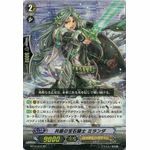 [ACT] (VC) [Limit Break 4]: [Counterblast (1), Lock 1 of your Rearguards with Jewel Knight in it's name] Retire up to 1 of your Opponent's Rearguards in the Front Row, and search your Library for up to 1 card with "Jewel Knight" in it's name and Call it to a vacant (RC). Shuffle your Library. This ability cannot be used again this turn. [CONT] (VC): If "Pure Heart Jewel Knight, Ashley" is in your Soul, this gains +2000 Power. This is fate...... mine, and yours. 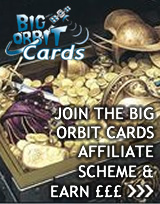 [ACT] (VC) [Limit Break 4]: [Counterblast (3) - Cards with "Eraser" in it's name] Retire all Rearguards of all players. [CONT] (VC): During your turn, for each vacant (RC) in this game, this gains +2000 Power. My thunder is rough. Are you prepared? 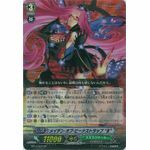 [ACT] (VC) [Limit Break 4]: [Counterblast (1), Lock 1 of your <<Neo Nectar>> Rearguards] Look at up to 5 cards from top of your Library and search for up to 1 <<Neo Nectar>> and Call it to (RC). Shuffle your Library, and that Unit gains +5000 Power for the turn. [ACT] (VC): [Counterblast (1)] This gains +2000 Power for the turn. There's nothing to be scared of. You will not feel anything in the end. 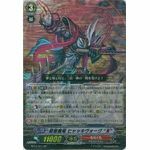 [ACT] (VC) [Limit Break 4]: [Lock 2 of your <<Murakumo>> Rearguards] Choose up to 3 of your 'Stealth Demonic Dragon, Hyakki Vogue "Reverse"'. They gain +10000 Power for the turn. [AUTO]: [Counterblast (2)] When this is placed to (VC), you may pay cost. 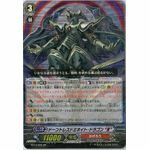 If so, search your Library for up to 1 'Stealth Demonic Dragon, Hyakki Vogue Reverse' and Call it to (RC). Shuffle your Library, and at the end of the turn, return that Unit to your hand. Dream, reality, phantom, eat the trinity flash! 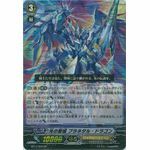 [AUTO] (VC) [Limit Break 4]: When this attacks a Vanguard, all your units with Sanctuary of Light in it's name gain +3000 Power for the turn. [AUTO]: [Counterblast (2)] When this is placed to (VC), you may pay cost. 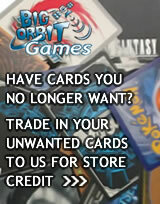 If so, search your Library for up to 1 card with "Sanctuary of Light" in it's name and Call it to (RC). Shuffle your Library. [CONT] (VC): If "Sanctuary of Light, Determinator" is in your Soul, this gains +1000 Power. The knights saw. The legend of light that has passed down in thesanctuary.